This poem is taken from the wall of a children's home in Calcutta, India, which is run by Mother Teresa. Thought this is useful for all of us who are living in this fast paced world. 1.Let his woman control his finance. 2.Let his woman control how she wants to renovate THEIR house. 3.Let his woman scold him in front of HIS PARENTS. 1.SMS or call the woman every hour to find out what she is doing. In other words, POSSESSIVE! 2.Use one lie to cover another lie. 3.Talk bad about his best friends in front of his woman. In the above definitions, basically, a good man is also a stupid man in the eyes of his brothers, but is an extraordinary good man in the eyes of his women, and in normal circumstances, in the "dollar-signed" eyes of most female compatriots! A bad man is not so bad if he can find a woman who loves to hear lies (99% of the population thinks you look fat, I'm the only 1% who thinks you are the prettiest and have the best figure in the entire universe! ), loves him to give her lotsa attention, lose all her friends just to live in a "Just the 2 of Us World" with her Mr.Right. So, all the best to those "bad mans" out there. You will find your Mrs. Right, problem ZERO... but, but please, please spare a thought for those who dread possesive man, destroy friendship and lie without blinking an eyelid. Just leave them alone...The whole world will be happier and this blog's entry won't have been created in the midst of watching an exciting Brazil Vs Greece match! When was your first kiss? Where was your first kiss? How was your first kiss? And who did you give your first kiss? Kiss Kiss Kiss... A kiss mean so many things. A kiss can mean..... I love you, I want you to know how i feel for you, I lust for you or I want to go to bed with you. Why all the kissing matter man? Well... I just watched Eye For A Guy and had witnessed 2 types of kissing. One was so romantic, the environment and mood for the kiss to be executed were there and it really makes kissing so easy, so natural,so easy and so romantic. The other was a bit forceful and overly passionate perhaps, which really wasn't my cup of tea. But it seems Denise enjoy this kind of kiss- so out of the blue, so manly and so taken charged of... It just shows there's no perfect kiss in the world. It brought me memory of my first kiss...Settings weren't the most perfect i should say, but both of us were ready and the kiss just arrived naturally. It was sweet and the best thing to have happened to me! It was perfect for me already! This email is written specially for the Singapore national soccer team and the future of Singapore football. I need to say something about the turnout and the media reports on the match we played against Malaysia. I am totally disgusted with the attendance. I don't need the figures (ie.18,000) to tell me that the crowd was disappointing. Where were the fans who cheered the Lions when we lifted the Tiger Cup? Are these people really just "glory seekers"? Let me remind these fans that the match on Sat was the Lions' first game as Champions of South East Asia! Where were these fans? Don't you think the Lions deserved a full house on Sat? So many people on the streets were talking about the 4-0 mauling by Malaysia in 2002 and they wanted revenge. So here we are, a match for the Lions to exorcise the ghost of 2002. And where are the fans? Just 18,000. C'mon, the match was played on a Sat(a weekend! ), no EPL distraction. So what excuses for the poor turnout? I am glad that you guys at TNP has done a good job in covering the lead-ups to the match on Sat! Keep in up! That lead me to start thinking about the amount of coverage that another print offered on this nice Sunday morning. Well, the coverage on the Spore v Msia match didn't even merit half a page long! C'mon, being the so-called NATIONAL paper, is that all you can inform to your readers about your own National Soccer Team? Well, to give them the benefit of the doubt, hopefully we can see more follow-up reports of the game on Monday morning. 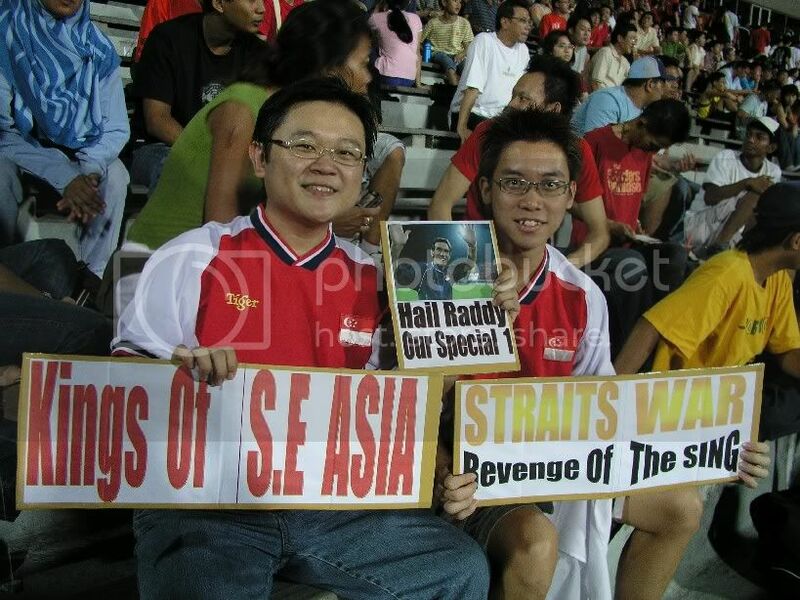 It seems that nowadays these group of "die-hard" fans' group is always seated at the National Stadium's gallery section. Have they neglected those people who have paid more to watch the game from the grandstand? May I suggest that this die-hard fans' group stationed another group of cheerleaders at the grandstand section. I was seated at the grandstand and I must admit I am ashamed to be sitting among a group of "TV watching soccer fans". Where was the noise? Kallang Roar? Nah, there wasn't any! Hard as the die-hard fans' on the gallery section tried to create the atmosphere, it fell on deaf ears. Another thing which i noticed... I don't think the die-hard fans came up with any new banners or signage. Where were the "Tiger Cup Champion" banners or something that can proclaim us as the champion of S.E Asia? It's not everytime that we win the Tiger Cup I mind you. I am not being arrogant here, just feeling proud of our own naitonl team's achievement. The Kallang Wave only made its mark across the cheerleaders. We can be so passionate towards EPL clubs but why not towards our very own National Soccer Team? Stop saying that we are Singaporean, we are introvert, shy and uninitiative. If we want to sing, we should just sing out loud for our team. If we want to cheer, just cheer. If we want to shout and scream, JUST DO IT! There's absolutely nothing to be embarassed about! I believe our fans can do better to show their support for their own National Soccer Team! Another scene which made me disgusted was the amount of fans wearing jerseys of EPL teams! I myself is a die-hard Liverpool fan but I will never ever wear a LFC jersey to our National Soccer Team's match! Do you know our very own National Soccer Team jersey is so much cheaper than any EPL clubs' jersey? But I must say there were many who wore our "National Day's produced T-shirt", which was quite encouraging to see. Alright, I have made my points here. 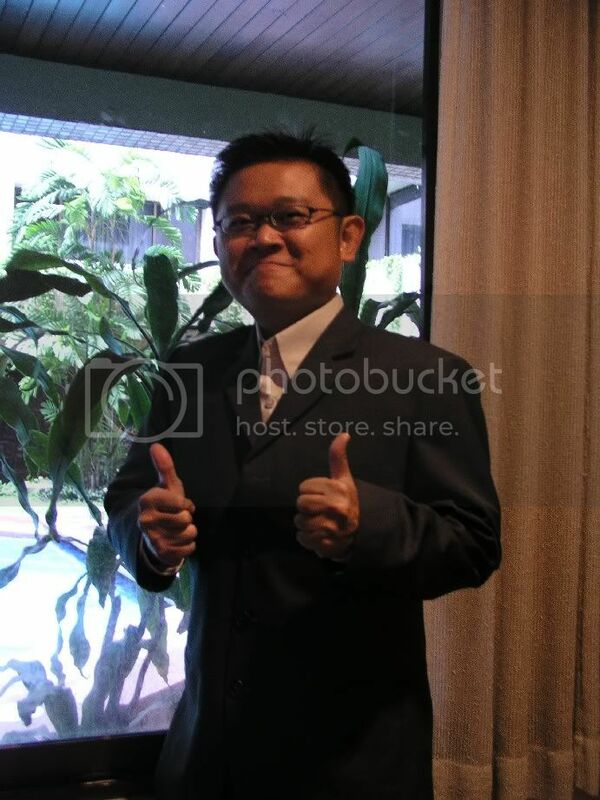 Hope you guys have a fun time reporting the match in Penang! Another victory for us! Your report in Sunday's TNP " The message on the A-board at the National Stadioum read: Bringing Singapore Football to Life." Just want to say that this is Singapore Pools' A-board. We don't need Singapore Pools to bring football to life. We need passionate fans who only care about our own soccer team and not on dollar & cents. Enough said. Peace. 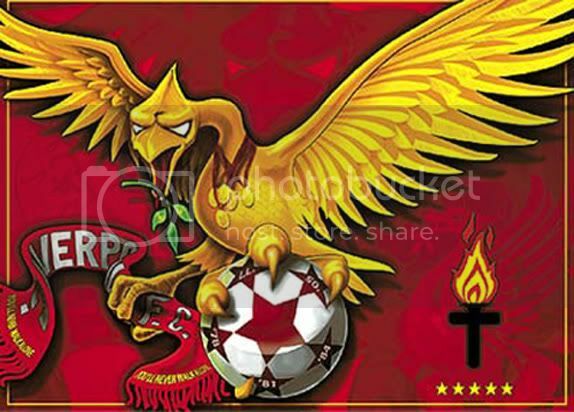 Crazy for Liverpool FC? I am! Crazy for Singapore Football Team? I am! Crazy for GiGi Leung? I am! Crazy for Star Wars? I am! Crazy for Yoda? I am! Crazy for blogging? I am! Cos' I still can't upload photos here! But of all my craziness...I know Cindy wants me to be crazy for her! Yup... it's been awhile since I did something for her. Things like buying her flowers, giving her surprises,etc... things which i used to do. Where have they gone to??? Such is this repetitive and monotanous life which I am living that I sometimes forgot to praise and reward those people who are close to my heart. Sometimes, we just need to slow down and look around us. There are so many wonderful things just awaiting us to be accomplished. Just recently when I was rushing to finish a few tasks at Marine Parade, a lady approached me to explain about The Spore Cancer Society. I was a bit reluctant initially but stayed on to listen to her. In the end, I was $100 poorer financially but a million dollars richer spiritually! I always believe that when volunteers come up to us for donation, we should always give them. They are not paid, yet, have to suffer under the hot sun, begging for our mercy. Spore Cancer Society, unlike some rich and popular organisation, depends on these volunteers to raise fund. To think that cancer is so common in our times, we won't know if we are the next victim. The agony of going through chemateraphy and other pains are tremendous. In my conversation with this volunteer, Jean, I discovered that they have to actually seek permits from the various authorities to do "on the street" fund raising. If you are listening the various authorities, please make it simplier for these SPECIAL PEOPLES who are forsaking their income to bring joy to the unprivileged. And to you my friends out there, do not reject them when these SPECIAL PEOPLES approached you on the streets. Stop, listen, give and you will find the joy that money can't buy. Walk On Walk On... With hope in your heart... And You'll Never Walk Alone...At long last! Liverpool is the Kings of Europe! Like what i say, what comes down, must go up...life is so ironic...In the midst of my sorrow and sadness, my team Liverpool FC lifted the European Champions' League trophy on the 25th May Year 2005! I think My Grandpa and God really love me. They allow me to witness one of the most amazing football match in the world on that fateful day. I was quite sore about not being able to enter the Singapore LFC fan club due to the large crowd and have to make do with watching the final at Hollandse Club(of all places! )But man, it turned out so wonderfully. Even the waiter at the club, Mr Christian, is a LFC fan. They were just 6 of us. One Milan fan, One Neutral and 4 LFC fan. How we enjoyed all the singing of You'll Never Walk Alone, hugging, posing in front of our videocam! We didn't want the night to end man! It was a night to be long remembered in years to come! Yes...when sadness covers you, be faithful and strong, happiness is on the way. And what a way to savour this victory! What a comeback! I salute all of you, my beloved Liverpool FC players. Thank you for the memories. I salute My God...I salute you, Ah Gong!